The incorrectly transcribed items are noted with an arrow and the corrections are shown in RED. Her gravestone lists the year of death as 1923 which added to my confusion. Luranie's brother, Gideon Cook is the informant for the information on her death certificate. He was a Civil War Veteran, a Veterinarian, and known as "Dock" Cook. I believe that Gideon's family must have always referred to W.C. Cook as Clifford Cook because he is listed as C Cook here and on Gideon's Death Cert as Clifford Cook. Her husband George W. Williams would die 6 months later(July 1924) Luranie & George are buried in the Simpson Cemetery in Rover, TN. Luranie has always been hard to find because her name is never spelled the same consistently. Even the Cook researchers never spell it the same. How do we ever find the documents we need. Persistence! One of my favorite databases at Ancestry.com is the U.S. City Directories, 1822-1995. In the 1990s when I was just beginning my research, I didn't give much thought to directories. I had imagined they were just like phone books. Wrong! There is so much more in a directory. Don't believe me? See my blog post from June of 2017--In Praise of City Directories. If you are an Ancestry subscriber(or your local library has access) you can browse to a directory of interest and see for yourself. I used the 1940 Nashville Tennessee City directory this past week a great deal. In an effort to save time I found the start of each section and made myself an index of sorts using the image number. This is something I'd recommend doing for any directory you will be browsing thru frequently. Browse the directories. There is so much that isn't indexed. I've noted the image numbers along with the pages for the directory I used last week and I'm including the outline below in case it would be of use to any others who are researching in that area and time period. This post is a continuation of my previous post about my Dad's paternal 1st Cousin, Margaret Ruth Thompson Cooper. If you haven't read that earlier post and click on her name in the previous sentence. I'm going to refer to her as Ruth because that is what my family always called her. On Ruth's death certificate it lists her legal residence as 129 6th Avenue South, Nashville, Tennessee. I'd never been able to find Ruth thru a search of the census so now that I had the address where she was residing in 1941(and also listed there in 1940 directory as mentioned in the earlier post), I took that information and went looking for the Enumeration District for that address using the Steve Morse Census Tool. From locating the address on a Google Map earlier I could see that the intersecting street was McGavock which narrowed it down to 2 Enumeration Districts. I then browsed to the first of the two districts mentioned which had 12 pages and read those looking at the Street names. Nothing...on to the next Enumeration District. About halfway thru the 20 something pages, I find the address. Margaret Ruth Thompson Cooper is listed as Margaret Moore. No wonder I couldn't find her. This is really odd to me because earlier in the directory for 1940 she is listed under last name Coopermore and the only one listed at the address in the directory. In the Census there are 4 other women who are in their 20s living at the same residence. Three of those women are divorced and one is widowed. Some answers but more questions. Are all these Margaret Cooper's the same person? 1. I know from the information on the Death Certificate that the person listed is Cousin Ruth. Her parents' names, place, and date of birth are exactly as they should be. Too, we have her maternal 1st Cousin as the informant. The residence on the Death Certificate and the census are the same so it seems likely that it was her. 2. She's listed as divorced in the census AND on the death certificate. Her former husband B. V. Cooper remarried in 1939. 3. Why is the name/word "more" or Moore listed in both the directory AND the census? Very odd unless she was married to a Moore and divorced sometime in between her 1st marriage and 1940. Also to have the word more added on the end of her surname Cooper in the directory is odd. She is noted as the person who gave the info for herself in the 1940 Census. 4. I think my next plan of action should be to look at the other four persons enumerated with her and see if I can determine any connections. 5. Additionally, I need to find her divorce records from B. V. Cooper. My Dad's paternal 1st cousin Margaret Ruth Thompson Cooper passed away in 1941 from tuberculosis. I have a digital copy of her death certificate which lists her address as 129 6th Avenue S, Nashville, Tennessee. On seeing the address and noting that the certificate said she had been sick for 6 months I had thought the address was probably a hospital or one of the sick houses for those with TB. So I went looking thru the 1940 Nashville City Directory for that address. I found her listed but her surname has the word "more" added to the end of it. I checked the abbreviation key page and didn't find "more" listed. If it is a boarding house and there are more people why are their names not listed? Odd. I was curious to see what is in that location today so I checked the address on Google Maps. Today that would be near the Ryman Auditorium, Bridgestone Arena and not far from Nissan Stadium. She is listed there in the 1940 and 1941 directory. In the 1938 directory, she is listed at 107½ 4th Avenue North, Nashville, Tennessee. The 4th Avenue address is only a few blocks away and is closer to the Ryman Auditorium. Given this information, it seems that this was a neighborhood she had live in for at least 4 yrs. Margaret was listed as Mrs. in her last two directory entries. She had married in 1933 in Williamson Co TN to Burgess V Cooper. I haven't found her divorce yet but Burgess remarries in 1939 and she is listed as divorced on her Death Certificate.The informant on her Death Certificate was her cousin J. W. Cook, son of her maternal Uncle Clarence Cook. There were many from my family who died of TB within the 1920 to 1945 timeframe. I've not been able to find her in the 1940 census but with the information obtained from her Death Certificate I know she was still alive and the city directories tell me where she is living. I really need to do a bit more digging and get her story out. I feel like I have just scratched the surface. I use the MedBetterDNA browser extension(available for the Chrome Browser) so that the notes section is visible from the match list without clicking thru to the match page. My genealogy goal for this weekend is to finish sorting thru the 2nd page of my DNA matches at AncestryDNA and identifying thru which of my grandparents we connected. I'd already had some of them done as I like to make notes on new matches as they come in but had about 20 to finish. I'd finished the first page of matches earlier in the week. I do this by checking to see if they match my Mom's kit and looking at the shared matches. I have DNA share links to view results for a few close cousins from each side and that helps when trying to find the connection. You can click thru to View Match and click on that matches name to go to the profile where you can click on Select DNA Test and select any of the other tests which you have permissions to view to see if they match. Also clicking thru to the match page helps because sometimes they do have a tree but have not linked it to their DNA. Use caution because sometimes there are many trees not attached and you may not be able to identify the tree containing the DNA match. Also, remember that shared matches tab only shows those matches which you share at the 4th cousin level or closer. Use the Select DNA Test from the profile page when you start getting down to the cut off amount for 4th cousins to check other profiles. I also try and keep track of my top matches on all the testing sites where I have a copy of my DNA results. I do include the 23&me ones which are uploaded to GEDmatch as I am not at 23&me. I also use GEDmatch amounts if I have them and don't include anything less than 7 cMs. This allows me to see how many of my matches have uploaded or tested at a site which has a way to get those amounts. Also, it shows me how many segments I could likely identify if the Ancestry testers were to upload to one of the sites which have a chromosome browser(MyHeritage, GEDmatch or FTDNA). I normally only add matches which share 50 or more cMs with me. I do make an exception for the unknowns 40 cMs and up. While you are searching for your ancestors in newspapers, don't miss out on finding them by failing to search for them under the initials of their given names. My paternal grandparents lived in Old Hickory, TN from 1920s up til about 1950. My Grandfather, Thomas DeWitt Cooke is usually listed as T.D. Cook in the Old Hickory social news column. His father, William Green Cook is listed as W. G. Cook and in some cases Wm G Cook in real estate transfers, community news, and family celebrations. Of course, there is a bit more involved in verification so that you can be sure you have your man(or woman). See the example below from a paragraph which listed persons in attendance at a birthday celebration. In the article, it says many pictures were taken. She passed away 19th of Oct 1938-- about 5 months later. While researching the YDNA of the Cook line I have found a line that connects back to Shem Cook(as our YDNA line indicates) that also named a daughter Angeline and their daughter was also born in 1838 Georgia. I have several of her descendants which have autosomal DNA tested who match me or my siblings. I also have a number of descendants of those who attended her birthday celebration who are a match with me and/or my siblings. 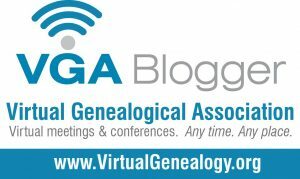 Is Your Earliest Known Ancestor listed correctly in your FTDNA account? Over the past 5 months, I've spent time working with my family's YDNA and mtDNA results at FamilyTreeDNA(FTDNA). When I initially registered my account at FTDNA I was doing so in order to transfer a copy of my autosomal results from AncestryDNA. Admittedly, I did not fill out all of the information other than what was required until after my results processed. The Earliest Known Ancestors tab was a bit confusing to me. I did finally realize that they were wanting my most distant patrilineal line and my most distant matrilineal lines. I believe since that time(3+ yrs ago) they have changed the wording but it is still a bit unclear to some folks. In the example below I am using the pedigree of my maternal Great Grandmother. If she had an FTDNA account(oh how I wish) and need to fill out that information the path she would follow on her pedigree to get that info is marked by the arrows. Blue arrows mark her patrilineal line. Red arrows mark her matrilineal line. I have used the LARGE arrows to indicate the ancestors that should be listed on her Earliest Known Ancestors tab. Of course, this is from my perspective and she may have known those lines further back than that. If so, she would have included the most distant one from each of those paths. FTDNA asks for this info because if you are a male, the patrilineal line will be that associated with your YDNA test. Females do not have a Y and cannot take that test but fathers, full brothers, and paternal uncles etc. can take those test so they should list their father-line as well. The matrilineal line shows the path of your mtDNA or your mother-line. Males AND females can both take mtDNA tests but only females pass on their mtDNA to their children. If you have an account(or accounts) with FamilyTreeDNA, PLEASE take the time to check and make sure you have this information entered correctly. While you are doing that, it would also be a good time to make sure you have designated a Beneficiary for your account. Hope this helps! 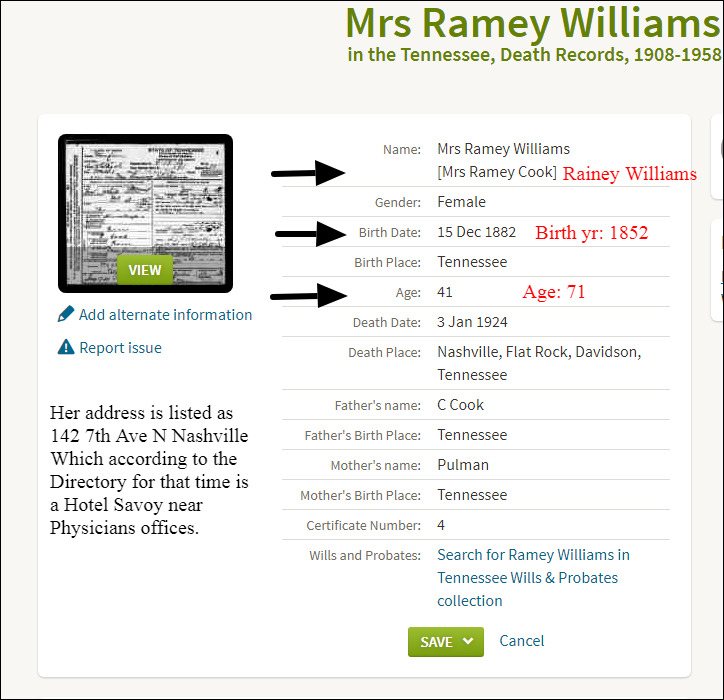 When you are adding records to your tree at Ancestry or any other site, ALWAYS click thru to view the actual image. It may not be the person you think it is, OR the name may not be correctly indexed. If you had looked at the image(both shown below for comparison) you can see that it says Drucilla. There may be additional information on the document that wasn't noted by the indexer as well as other errors in the indexing. It really is worth your time to do this. This particular record doesn't add the nearest relative or a relationship but there are some which do. This could waste your time chasing someone who doesn't exist. If you can add a correction when you notice these, please do so. If it doesn't allow for a correction to the indexed item I usually leave a comment with the correction so that anyone else viewing the index will be aware. The purchases are likely where he is living in the 1940 census. While his neighbor in the census is not SAM Haynes it is a Haynes family. Look at the difference in total that my sister and I share with our 2C1R as compared to what our brother shares. If my brother had been the only one who tested we would have missed out on identifying over half of the DNA which was received via the Cook/Putman connection. I should mention that this paternal 2C1R(who is kin to us thru his paternal lines) is also a maternal 4C1R(thru his Mom's McElroy/Shropshire lines ) He shares no matching DNA with my mother at the 5cMs/500SNPs threshold. Since our Dad passed on before we began testing we can't know what he would have had in common with this cousin other than looking at what all of his children have in common with this match. Still, there may have been segments that my Dad did not pass on to any of us. The next best thing we can do is test his sister and see what segments she shares. By testing our Paternal Aunt who is a 2nd Cousin to this match we are able to identify 7 additional segments with this Cook/Putman cousin. These are segments which neither I or my siblings received and are noted by the blue arrows in the above image. There seems to be pretty good variation in the Chromosomes which I share and those which my two siblings share with each of these 2C1R Thankfully I didn't stop at just testing myself as I seem to have less shared segments. Let's see how my Aunt compares. She is their 1C2R. It looks like our Aunt has most of the same segments in common with these two who are her 1C2R. We were still able to identify a chromosome segment that my siblings nor myself had gotten which came from the Cook/King couple(noted by the dark blue arrow) Also we were able to pick up more cMs on about 5 other segments which are marked with the lighter blue arrow. There is a good deal of randomness in the heritance of DNA once you are back past your parents. Test 2nd Cousins, Aunts/Uncles, and siblings. 2nd Cousins are gold mines. They will really help you sort out the information you need in order to identify your matches. Too, if you expect to be able to identify 3rd and 4th cousins you need to have a well-researched tree and know the descendants of your 2nd and 3rd Great Grandparents. I did an inventory of my top matches at AncestryDNA just to see how many of my matches who are listed in the groupings as 2nd cousins or 3rd cousins had uploaded to GEDmatch. I also wanted to get an idea of which group was testing more and an idea of where there are some opportunities. Ancestry doesn't have a chromosome browser and likely never will, so if I'm wanting to identify any segments matches with those who match me there I must ask if they will consider uploading to another site which accepts transfers or to GEDmatch. MyHeritage just recently released some new tools which include a chromosome browser so that is now a new option when looking at segment matches. 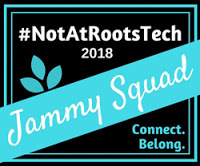 Even though there are several I cannot positively identify I am able to tell which Grandparent connects our families. eventually, maybe the 4 closer cousins will upload. I've contacted each of them. Just a waiting game I suppose. Over half of those who have uploaded to GEDmatch are from my PGF's line. I wish I had more from my MGM's line who have tested. There are some further out in the 4th Cousin Grouping and I'm thankful for that. I have the most work to do on her lines, especially her Hale line. The Pittmans of my MGF's line LOVE to test at Ancestry(I'm guessing for ethnicity as that line has Native American) but they do not love to upload to GEDmatch. There are close to 20 kits(some in 3rd and more in 4th cousin group) from the Pittman/Adcock and Pittman/Hatfield lines which would be a great study in a chromosome browser. I am lucky to have so many of my 3rd or closer cousins testing. Colonial Ancestry on both sides with virtually no ancestors immigrating after 1800 likely has a lot to do with that. If you have tested with AncestryDNA, can you group your Top 25 AncestryDNA matches into 4 groups? Even if you have unknowns this is doable. It's the approach I use when helping adoptees who don't know ANY of their grandparents. Use the Shared Matches tab to help do this. The DNAgedcom client will also help if you have access to it. You would need to download your ICW spreadsheet and look for each of those top 25 matches. What's happening on Chr 18? In my previous blog post, A DNA match who shares 3 different kinship paths, I had observed that while my Mom had two segments on Chr 18 my Brother appeared to have one long segment shared with the match. Looking at the Chromosome browser graphics(using the legend) you can see that there is a little "skip" in the segment. A no call in my Mom's results, maybe? Which shared segments are shared by all 3 siblings? I wanted to get a clearer picture of how the shared segments survived or didn't from one generation to the next. I'm adjusting the segment number that my Mom shares with this match to 12 segments as the two Chr18 segments are really likely one long segment. There are only 3 segments of the 12 that all three of her children also share. That's 25% of the shared segments that were passed to the next generation. Or 75% which didn't get passed down--at least in this case. Notice too that my brother only received a portion or the Chr 6 segment. So only 2 segments passed to all 3 of us in their entirety. My two brothers who have not tested may have gotten different segments or they may have the same three that my brother, sister, and I share. Neither of the brothers who haven't tested have any children. It would be interesting to see if these three segments made it thru to my nephew and nieces if they test. My daughter didn't get any of the 3 segments which are shared by all 3 of us. This is a great example of why you should test as many siblings as possible if you have only one parent available for testing. I really don't want to think about how many segments were "lost" from my paternal lines because my Dad never tested. Thankfully his sister tested. Sounds like an idea for a future blog post(s) as I have 2 sets of 2C1R to use for comparison with my aunt and my siblings on my paternal lines.